The greatest pleasure of my three years as IPAA national president has been the chance to meet and hear from public servants around Australia. Most wish to make a difference. They worry about doing the best for their community; they take joy from helping Australians; and they believe that Australia is indeed a fortunate, open, sane society which it is a privilege to serve. We have regard to the national interest when we ponder policy and we believe in the fair treatment of all Australians by public servants dealing with them. Indeed there is a professional ethos amongst public servants which is not always apparent in organisations engaged as outsourced service providers. But, our circumstances are changing because the society in which we serve the public is changing. There are challenges and opportunities ahead for us. We must embrace them to do better. So what are the big challenges ahead of us? Challenge 1: who does what in our federation? Transferring an agreed share of income tax revenues to the States as a national contribution to schooling for all young Australians. We need to clean out the programmatic confetti of grants that have traditionally been sprinkled by Commonwealth Ministers across the education sector. This has begun but there is a long way still to go. Implementation of the subsidiarity principle would also put the stewardship of the major service delivery systems at the local level within a new competitive environment. This would be to the immense benefit of everyone. We’ve already seen the potential of this approach in the success of casemix funding in reducing growth in the cost of hospital services in Australia — which comes in part from local hospital boards and health networks getting real governance responsibilities. We’ve seen it in the results published in the Productivity Commission’s “Blue Book” which shows that in states where devolution has been a long-term, bipartisan political objective, per capita cost of hospitals and schools has been lower than in most other states. It is also striking that one of the most complex health systems — public hospitals — are still operated by state governments and that — thanks to reforms like casemix/activity-based funding — they are run relatively efficiently and successfully. In fact it’s the Commonwealth’s areas of responsibilities in health — primary care and aged care — that continue to exhibit major difficulties, and that are a source of dissatisfaction in the community, and that result in avoidable cost transfer into the public hospital system. Generally, we would be better as a nation if, incrementally, the Commonwealth simply backed out of service delivery and either transferred funding to the states — or made payments available in different areas based on a standard funding basis per person or per transaction. The overall cost of the public sector in Australia is low by international standards and our problem is that we have policy debate that seems mired in extremes – as being either ‘a revenue problem’ or ‘a spending problem’. Anyone with experience in public policy and public sector management know that those simple binaries almost always obscure a more complex reality. As part of a grand bargain between the states and Commonwealth — there needs to be more revenue raising by the states and hypothecation of that fundraising for the pressing infrastructure needs of our cities. But as part of that bargain – we would keep the overall percentage of GDP spent on the public sector to be constant. One practical way for the states to raise this revenue would be for them to develop a land tax, or property charge, with a broader base of applicability — but at a much lower rate than currently applies. The underpinning principle of that tax or charge should be that the revenue raised should be spent in the city in which it was raised: if it is raised in Melbourne or Newcastle then it’s spent in Melbourne or Newcastle. Substantial portions of this new revenue stream should be hypothecated to transport improvements, particularly public transport. This would have the added equity advantage of making asset-rich inner-city dwellers draw down some of their windfall gains in property value over time. This is a legitimate policy goal because these gains are, in part, a product of historic infrastructure investments funded from general revenue, especially for the purposes of roads and public transport as well as general urban amenity. At the moment, the only people paying direct, hefty charges for public infrastructure are the least well off in major cities, struggling to afford a house and land package in outer suburban developments. The other great virtue of hypothecation is that it is one of the few pieces of economic orthodoxy that the public actually understands! If you tell the public that we raise this money and it goes directly to pay for that government action — as we did with the East Timor levy and the gun buy back — then the community is generally more predisposed to accept it. As the Productivity Commission cautiously suggested recently, state governments could extend road use charging to existing freeways, highways and major arterial roads within cities. This revenue would again be hypothecated towards the building and maintenance of these classes of roads and availability-based payments to public private partnership consortia where needed for new roads. This funding could be further augmented by the fuel taxes collected by the Commonwealth being hypothecated towards building and maintaining roads. The community is legitimately angry about the idea of paying more for roads, when the original intention was that fuel tax would go towards this function. Transferring most of these tax revenues to the states could be part of an historic settlement to partition government roles in transport in favour of the states and local government and would roll back the current process of the Commonwealth second-guessing other governments. It would help grow the economic contribution of our cities which are incredibly significant in terms of the economic activity they generate. Eight per cent of the value of all goods and services produced in Australia is generated on just 0.2% of our nation’s land — which is mostly cities. Sydney is 73% of the New South Wales economy and Melbourne is 81% of the Victorian economy. The CBD areas of our cities are even more significant. The CBDs in Melbourne and Sydney are just over seven square kilometres in size — but in 2011/12 that tiny area generated almost 10% of all economic activity in Australia, and more than three times the contribution of the entire agriculture sector. It would help redress the inequity where our cities generate an enormous percentage of national wealth — but where their taxes effectively disappear into consolidated revenue at the Commonwealth level. It would also provide the resources and legitimacy to fill one of Federation’s most pressing gaps in governance: long term strategic planning on a whole-of-city basis in land-use, transport, utilities, hospitals, schools and TAFEs. There is a very persuasive argument that the next stage of the digital revolution will unsettle employment markets in most occupations, professions, trades and industry sectors. In fact it’s possible to imagine the displacement being so great that the adjustment to changing expectations of employers, including those in the public sector, will become a central preoccupation of government and the community. But on the more positive side it will also help to give impetus to many of the reforms in our sector that have been underway for a while. The speed of a digital age, rising community expectations about the way services are delivered and the expansion of non-traditional media are all going to make many old government processes redundant. For example, the centralisation of public services — which have grown up in part around the need to physically put departments and ministers in the same city — is going to seem increasingly irrelevant. As will be the theological belief that big omnibus departments are by definition more efficient than smaller ones. It’s also going to make possible things that almost everyone has agreed are ultimately in our long-term interest in terms of better public administration. And allow us to devolve more authority to local service delivery systems, as technology permits easy access by the centre to real-time performance and accountability data — which is something that public sector and political leaders have a legitimate demand for. On top of that, technology will make it easier for local institutions to increase local involvement in their operation which in turn will help them broaden their mandate to pursue joined up delivery for citizens. In general we are weak in up-to-date public sector management and the professional assessment of how to reform strategically the delivery of services in the public sector or under contract in the private or third sectors. My own experience is that we still lack mechanisms that show public sector staff how their work contributes to the overall goals of their agency and how, in working with other agencies — they can deliver a better joined up response — and just as importantly how the work of different agencies contributes to the overall goals of government. If government agencies cannot solve this problem the delivery task will inevitably be outsourced to organisations that can. Renewed vigour in fostering innovation, assessing performance, rewarding high performance and investing in professional development for those on an improvement path are as important now as they have been for decades. Incrementalism isn’t going to be enough if we are going to devise — and advocate to for — the responses our nation needs. I believe that the interplay of innovation and creativity — as well as better management and greater efficiency rather than dutiful, repetitive process will be the future byword of public servants. At the Commonwealth level — and in many of our states — I think we now have political leaders with a genuine belief in the potential of innovation and creativity. There’s also evidence that they are interested in having a genuine discussion with the community about policy ideas. So my message to our sector: it’s time to gear up! Our position gives us a unique view into the development and implementation of public policy in Australia. But we are not just observers. We’re also disinterested players in what happens. We need understand the full potential of what our role can be. This is an edited extract from an address at the IPAA 2015 national conference in Sydney on October 14. 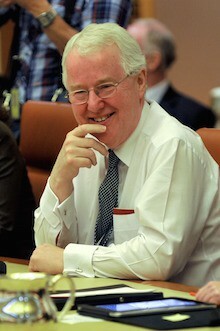 Terry Moran AC served as Secretary of the Department of the Prime Minister and Cabinet, Australia’s most senior public servant position, from 2008-2011, and as Secretary of the Department of Premier and Cabinet in Victoria from 2000-2008. Terry was National President of the Institute of Public Administration Australia from 2014-2015, and is currently the Chair of the Centre for Policy Development. He is an editorial adviser to The Mandarin.